Eric Johnson of KOMO TV news does a regular feature called "Eric's Heroes." His subject this week was Lamont Thomas, Shoreline's Running Man. LJ is walking now, rather than running, but he still follows his route from Aurora to the Shoreline Sea. 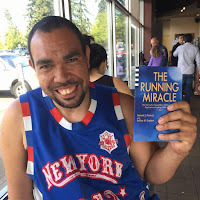 LJ wrote a book about his experiences, The Running Miracle, which can be purchased through Third Place Books, 206-366-3333.